Ninety-five-year-old millionaire Campbell Bradford is dying. His family have hired ex-filmmaker Eric Shaw to make a documentary about him, but Campbell’s childhood is shrouded in mystery. The only clues to his past are the name of his hometown and an antique glass water bottle that he’s kept his entire life. Arriving in West Baden with the bottle and a camera, Shaw begins to have vivid and disturbing visions. And the more he finds out about the town and the man, the more he suspects that something besides the West Baden Springs Hotel has just been restored . . .
Something dark and terrifying. And cold. Okay, okay, so I said I wasn’t book blogging anymore – maybe I lied, maybe I’ll be back on a semi-regular basis, maybe (and this is the most likely scenario) every once in a while I’ll pick up a book (like I did here) that might not be the author’s latest title (as is the case here) and I’ll want to shout about it a bit (yep – that too in the case of this book). 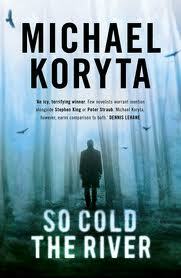 Michael Koryta started out writing crime/detective fiction, but it’s his most recent novels, starting with ‘So Cold the River’ which really made people sit up and take notice. I loved the storytelling skill of this novel, it’s a tale where for long periods not very much happens but there is just the right mix of mystery, crime and the always present fear of the supernatural that just keeps the 500 pages turning away right up until the last. I agree, loved that book. Glad you enjoyed this Keith. I know it’s an ask but if you find yourself with a couple of hours to spare in your schedule, I would really recommend ‘The Cypress House’ as well. A brilliant hybrid of John Steinbeck and Robert Jackson Bennett’s ‘Mr Shivers’ with a dash of Stephen King- a cracking read!